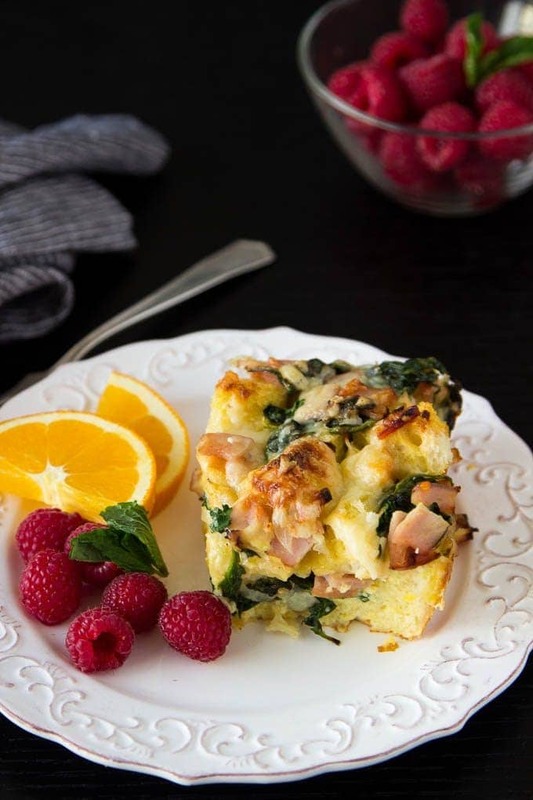 Easy breakfast casserole anyone? 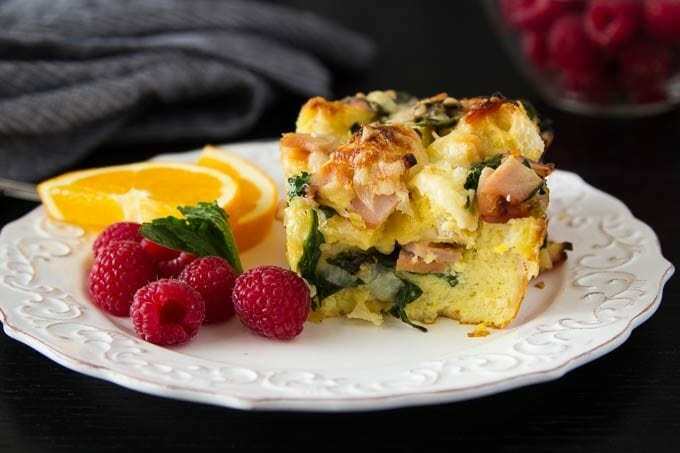 Breakfast classics like eggs, Canadian bacon, cheese, spinach and toasty bread are combined in one dish. Prep and assemble ahead of time. In fact preparing this dish the night before is optimum (but can be done day of as well). Then just pop it into the oven when you are ready to enjoy a slice of breakfast heaven! 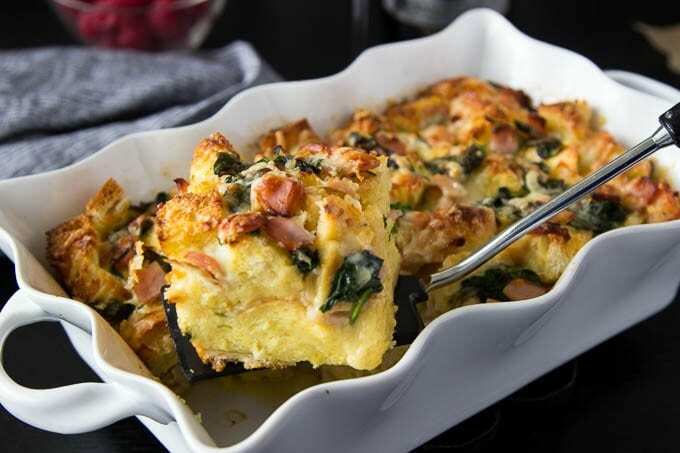 Breakfast, Brunch…a house full of holiday guests, a lazy Sunday morning, maybe even a random Tuesday morning…that’s when you can whip up this super easy breakfast casserole. 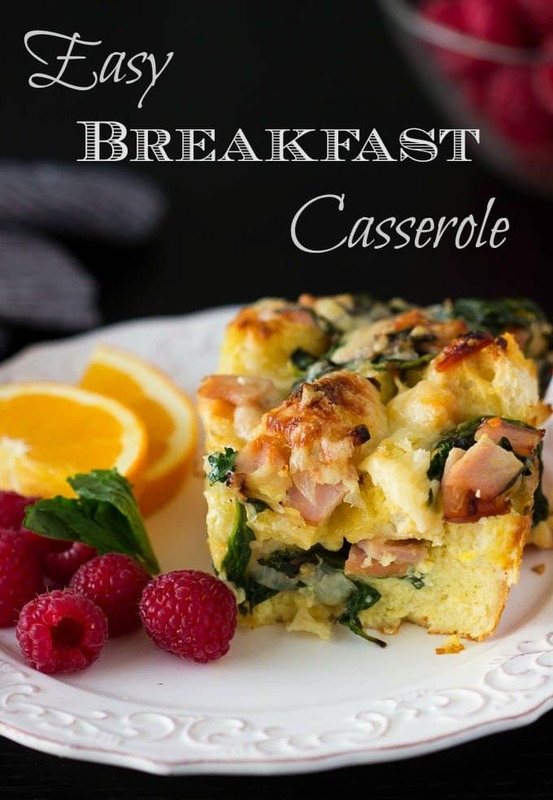 I guess what I’m trying to say is that this casserole is perfect for anytime you feel like some savory breakfast goodness. Something special happens when you let bread and eggs mingle for a bit (like overnight) they combine to form an almost custardy french toasty kind of thing. 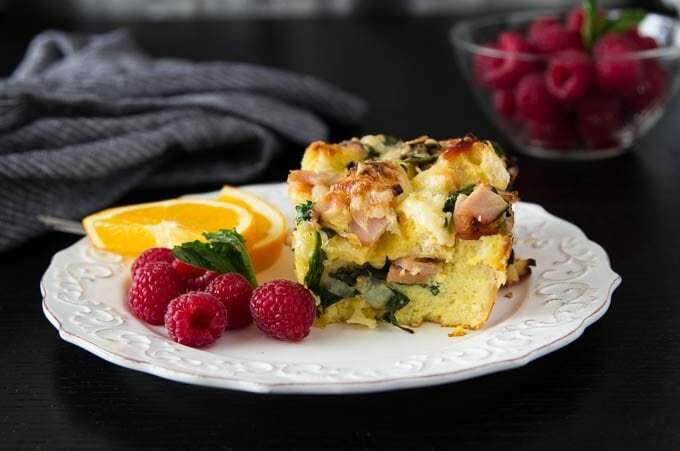 Add in some savory Gruyere cheese, spinach and Canadian bacon and I’m just sayin’….YUM! and more YUM! I’m calling this a “breakfast casserole” but feel free to think outside the box for places/times that some eggy goodness would fit the bill. 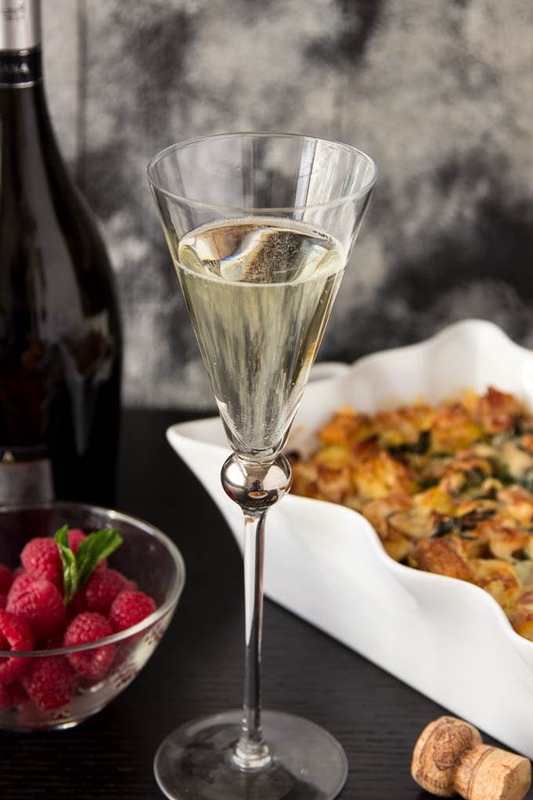 I’m thinking things like bridal and baby showers, brunch/lunch with friends, or you could even prep this before you start your New Year’s Eve celebrations and pop it into the oven to serve your party guests at the stoke of midnight. So if you’ll excuse me…I’m dashing off to the kitchen to heat up a slice of this casserole ( yes, you can reheat the dish in the oven (covered in aluminum foil) or zap in the microwave . Spray a 8x11 or 9x9 baking dish with non-stick cooking spray. set aside. In a large skillet heat olive oil over medium heat. Add onions and garlic and cook until onions are just about translucent ( about 2-3 min.) . Add Canadian bacon and cook for an additional minute. Add spinach and stir into mixture. Turn off heat and season with salt and pepper (to taste). Set aside. In a medium bowl wisk together eggs, milk and dry mustard. Season with salt and pepper to taste. Spread half of the bread cubes in the bottom of prepared baking dish. Spoon half the bacon/spinach mixture over the top of bread. Sprinkle half the cheese on top. Repeat by spreading the remaining bread crumbs, topped with the remaining bacon/spinach mixture. Pour the egg mixture over the casserole, making sure to get the sides of the dish. Top with remaining cheese. Cover and refrigerate for at least 2 hours (or overnight).